I took my kids to a public pool today, and it was a sad experience, in a way. 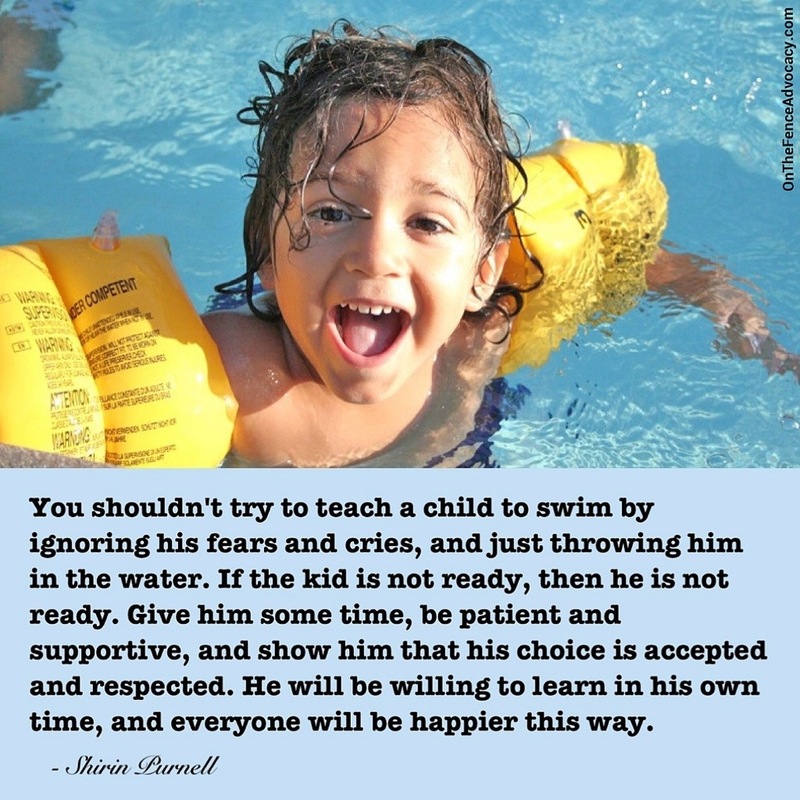 What is it with parents disregarding their kids’ wishes about not being dragged in the cold water, not being forced to start learning to swim? This is NOT how you teach your kids to stop being afraid of water. This is NOT how you teach children to swim. I don’t like it when I hear parents boast how they just threw their screaming kid in the water and he had no choice but to swim, and look at him now, yay! Sad ‘yay’, really. Sad that we choose to ignore to listen to what our children are trying to tell us and proceed with our own agenda. I know some adults who are afraid of water and can’t really swim, or can swim but are not comfortable doing it, all because their caregivers just kept throwing them out there telling them it was ok, they could do it, they shouldn’t be afraid. How can you tell someone to just stop being afraid of something by forcing them to be emerged in that something when they are not ready? It doesn’t make sense to me. Does it to you? Can we stop forcing our kids to grow up faster than they are able to? To not listen to their cries and clues? To keep pushing for something WE want them to do, even if THEY don’t want to do it at this very moment. Maybe if we give them time, show them respect and support, drop the idea until they seem to be more willing to try that again, maybe then they would just jump into the water themselves and thank us for waiting it out a bit and respecting what THEY wanted for themselves? Imagine what that would do to building a trusting and loving parent-child relationship. I agree with you completely! I think this idea of child readiness spills over into so many areas of parenting. Why potty train an 18-month old if your only motivation is your convenience? Why leave your baby alone on the floor to cry until they roll over or crawl or what have you? The problem I see with all of these things is that they raise issues of trust v. mistrust between parent and child. In the case of the swimming pool, if you throw your terrified child into the water as they cling to you and beg you to stop, how can they trust that you will come to their aid when they begin to sink? It’s a scary thought. Thank you so much for saying it. It is encouraging to see that I am not the only one who feels this way.